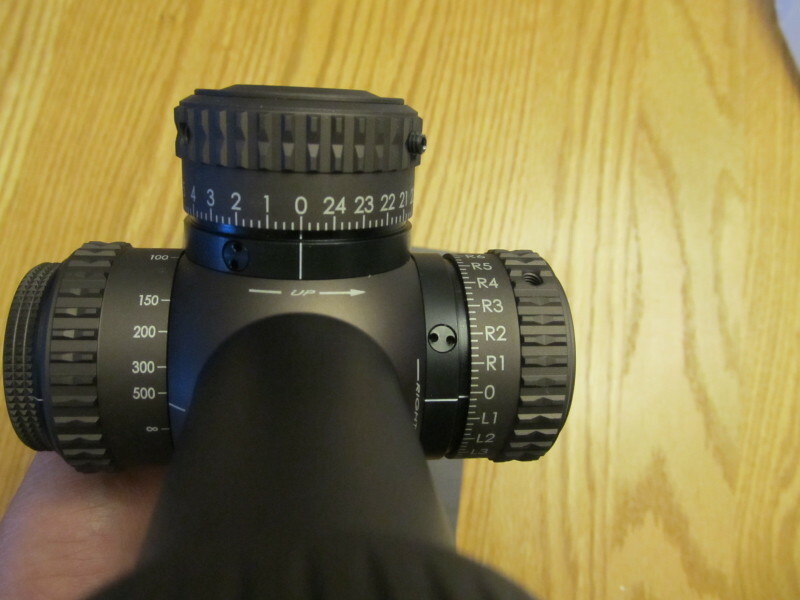 This was a scope I really wanted to review and was lucky enough to be able to borrow a brand new in the box unit. As been with my other reviews, I am not worried about the mechanical side of the scope. Scopes in this price should work… they better work… so I am really concerned about the optics and how that can help you make hits at LR. Vortex hit the consumer market a few years back and has done an amazing job at gobbling up market share. I think they may well be the most represented scope in the retail scene? Hard to bump into someone that hasn’t got one, had one or shoot with someone that does. Backed by a no nonsense warranty and really listening to their customer base, they now offer a huge range of product that are not only current but relevant ie… what shooters actually want. Now as a consumer grade product, their price point and performance would not keep many top tier brand engineers up at night. In fact, many of their products are functional with price, warranty support and features the main reasons for purchase. There are no shortage of shooters who have used this wonderful warranty. Looking through several higher grade Vortex products has always left me with … Meh…. nothing special. Over the last couple of years, Vortex has tried to change that with their Razor line. 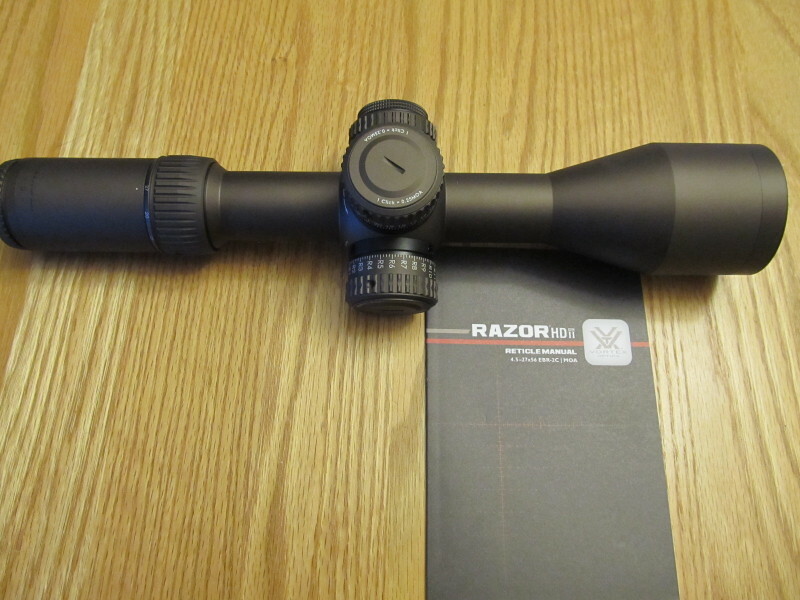 The first go were more “Meh” but the Gen 2 Razor tactical scope was met with rave reviews and demand that seems to defy the market. So I really wanted to get my paws on one and see what the fuss was all about. Comparisons to S&B (my favorite glass) really made me sit up. Vortex is certainly not shy in the pricing of these Gen 2 Razors with a ball park of $3400 to 3500 Cdn as of this writing (fall 2015), we are WAAYYY into the deep end of the top tier scope budgets. S&B money…. substantially more then NF and such wonderful new products as the Sightron SVSS…. within range of exotics like the Euro scopes and Tangent Theta. Interesting indeed. Unboxing the scope revealed that Vortex has invested well in the type of presentation you would expect when spending this type of coin. Great packaging, literature and paperwork. The first thing you note when picking up this scope is WOWSA, this thing is heavy. I get to play with a lot of big target and tactical scope. Some are quite portly but this Razor is the heaviest scope I have ever picked up. For some, that is a good thing. For others, not so much. I will leave that up to your tastes and application. I am only here for the glass. As with my other reviews, I test by looking at objects 1000yds and beyond. This really separates good from great glass and exposes a lot of subtle differences you simply will not notice looking across a store or at short ranges. Designed for LR applications, I feel the intended audience demands that level of performance. Please note that my review follows the same categories and are relative to the other scopes I have compared (S&B, March, NF and Sightron SVSS) – see my other reviews. As the scope came out of the box, the elevation was full down and the windage was centered. The reticle/eye piece focus is the now common fast focus and it worked very nicely. Controls moved smoothly and with enough resistance for a very nice feel. Very nice and long. Yes, this is not exactly a high mag scope but the long eye relief is a big welcome to many other brands (S&B and March and NF). Near identical to the Sightron SVSS. No risk of getting scope rash with this scope. Again, very nice. Easy to find image center. Quite forgiving with eye position. Edge to edge very clear and very little “black ring”. You get a real sense of a nice expansive comfy view – like looking out a big window. Of all the scopes I have compared, the SVSS was the best in this category by a comfy margin (eye box with long eye relief). The Razor is right there and I might just give it the nod if I was pushed to choose only 1. This is an area that many many scope companies should spend more time and efforts on. It provides such a nice user feel and will reduce viewing fatigue. It really is important when spending long periods viewing. Smooth but like all the others, is quite touchy. The yardage markings were not even remotely close… manf should just leave them off cause it is almost never right and causes new shooters all sorts of distress. It is stiffer then some but that is neither good nor bad… more a taste thing. It isn’t going to move on its own during firing. Functional for sure but the SVSS is still champ here. From the opening comments, I am sure you have guessed most of the Vortex line is not going to make my best glass choices. And that I was very skeptical that Vortex could make glass similar to the S&B. Well, as the scope comes out of the box, it does! Surprised? You better believe it. Colour and warmth is very very similar to S&B. 1000Yds even with some flowing mirage, everything was so natural, easy to pick up, separation superb… Ok, I am impressed and it IS very S&B like. On my 1000yds chimey test, it killed it. The tough to see crevices and edges that cause many top scopes fits, were easy to pick and I did compare over several days in various lighting. The vast majority of targets we would shoot at can be resolved and picked up in a heart beat. In my past review, the SVSS beat some pretty big scopes in this test. The Razor matched the SVSS and beat it on the heavy mirage days. Like the S&B, the Razor glass is designed to see through the mirage and that it does very well. If you are a mirage lover like me, this is not ideal. I will choose the SVSS. If you are an S&B see everything even when things are muddy type shooter, you will feel right at home with the Razor. And the glass might be a schnick better….. The Razor is the heaviest scope I have ever picked up. It is heavier then some spotting scopes I have used. This thing is a pig. For my needs, this is a big negative… I am already grumbling with the SVSS and that is a light weight by comparison. Think real hard about the total payload when you add 34mm rings (better be damn good ones) and the steel base to keep all this optic from tearing off the receiver. If you go steel all around, expect to add 1lb on top of the weight of the scope. Then there is the issue of base bolts…. go #8 as a minimum and maybe add 2 more (6 vs 4). A very good time to have the steel base pinned to the receiver or have recoil lug. This can and will be a big problem for standard mounting and “tactical” alum hardware if put onto a big gun like a 338 Lapua magnum. I would want a lot of steel in the clamping and contact points. Well, review is going very well for the Vortex. I am impressed, surprised and changing my opinion. So I get to playing with the turrets and other features of the scope. And unfortunately, stuff starts to not go so well. The elevation turret doesn’t have the typical inner marked sleeve and the outer just screws upwards. The Razor turrets just rotate and on the side of the scope, out pops a pointer. This only happens on the elevation turret. Each revolution triggers a new line. That pointer just looked like something I would break off with rough use or snag on something. I am big on getting rid of any sharp point on my rifle… this pointer is just something that really bugs me cause it is something I could damage in the field. Then I really am stuck guessing where my elevation setting is. I know it is all the rage to have features that allow you to “function” in the dark. Sorry, I don’t shoot when the sun goes down and neither does the vast majority of shooters. But if night shooting is for you, make sure you don’t tear it off while you are feeling it. And oh by the way, better get real familiar with how far it sticks out for each revolution (this is not a 2 Rev turret). Ok, something better left for the dark. I didn’t play with the Zero stop. Reports have been positive so will leave it at that. The windage is marked with left and right direction, you get ½ a revolution then the right becomes left and so forth. Are you ever going to need more then 12 mins of windage? If you shoot in the prairies or ELR, very real possibility. For a large tube scope, I would expect more windage travel. 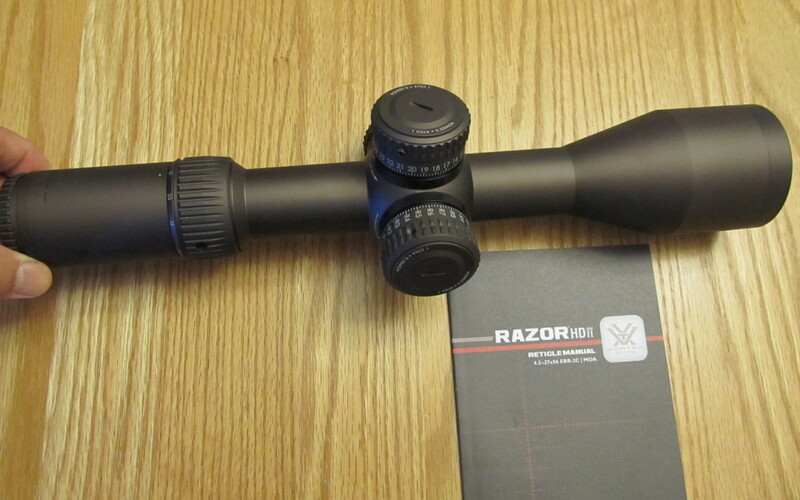 Other tactical scope offer similar set up but have more windage adjustment in that ½ revolution. Understand why the design would not want a user to dial their windage turret round and round with the possibility of getting lost but it should offer enough travel to cover possible shooting situations. And yes, I have shot in winds that needed more then 20 mins of wind. Centering the scope will be very important with this type of windage design. In all this fiddling with the turrets, I also looked back out at my 1000yds “target” and I was floored by what I saw. The image that I just raved about absolutely TANKED. 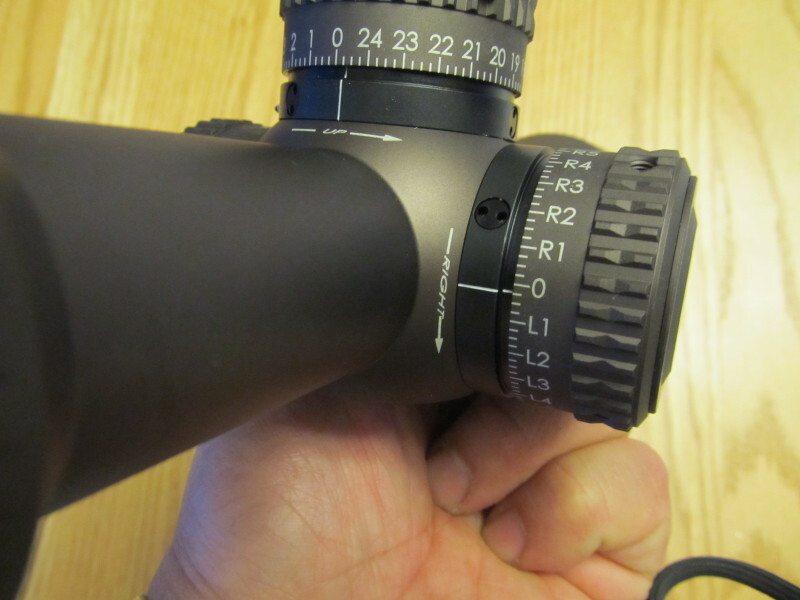 At full up, the quality was not much off entry level scopes – Think $3400 with a missing zero. Things in the vast majority of the view was blurry and resolution …. leave it at blurry. So I repeated this… back down to full down… YUM… All the way up… YUK. Then I started viewing as I added in more elevation. This is an MOA scope with 25mins per revolution. At 1 rev plus 10 mins (35mins from full down zero mark), you could begin to see the blur line start in the bottom left corner of the field of view. By the time you got to 2 full revs, the distortion was pretty much through the middle. At full elevation, all of it was pretty bad with the bottom half and left side of the lense the worst. There is no other way to say it but something is not working properly. Something I see often with entry level stuff. The lense is ground to look useable as you would receive it out of the box – ie when you are viewing it in a store – but degrade when you move it through the full range of travel. Vortex did grind a significant portion of the lense extremely well but definitely cut corners. Maybe their audience would never need to dial that much elevation into the scope? But given how wonky zeros actually are, how would they know where this scope would be zeroed? I have advised that this scope go back for warranty. 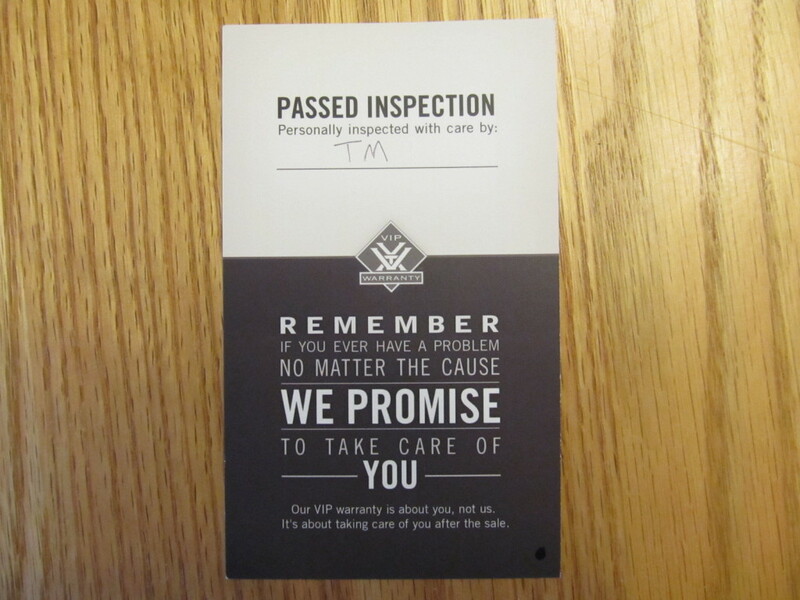 Maybe just a dud scope but inspector “TM” on the QC card indicated all was well so???? If this is typical, given the price point and intended performance level, totally unacceptable. 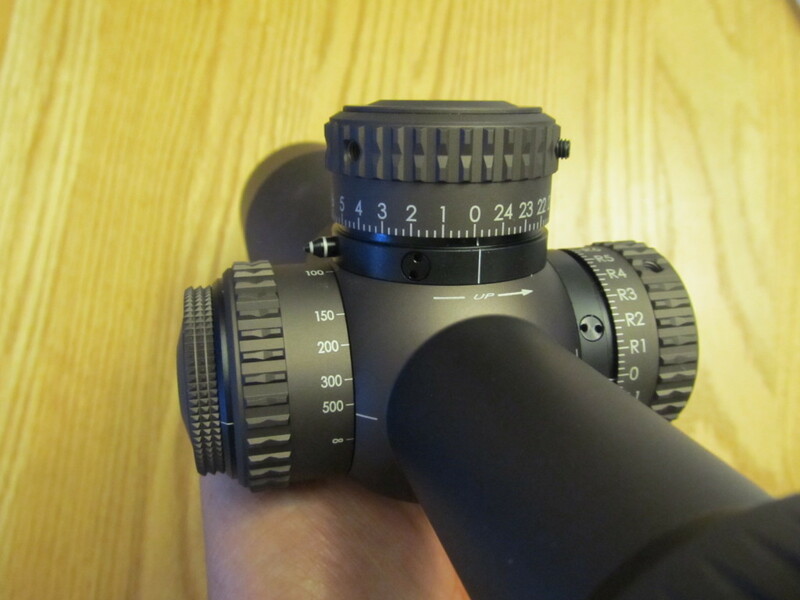 So if you are thinking of buying this scope, move those dials and see if things also change. NOTE: I have since looked at another scope and it shared the same problem so buyer beware. For now, all the out of the box goodness doesn’t stop the FAIL this scope receives. Hopefully, I will get to test the replacement or another. But, I will have to caution anyone thinking of this scope to give it a serious test before plunking down this type of coin. There are other top tier scopes that function superbly through their entire operating range. Some cost a lot less in several areas.